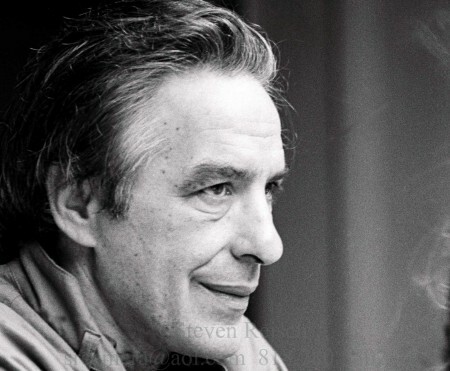 A visionary and a thrue independent, John Cassavetes had already created an indelible body of film work with such searing dramas as Faces, A Woman Under the Influence and The Killing of a Chinese Bookie when he undertook what was perhaps the most ambitious project of his career. 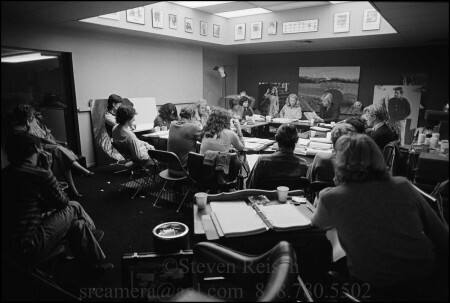 In 1981 he set out to write, direct and produce three interconnecting full-length plays in repertory, funding the endeavor entirely on his own and presenting them at a Hollywood theater that he and his co-conspirators refurbished themselves. With his eyes on an artistic prize that had nothing to do with monetary gain, Cassavetes refused millions of dollars from the fledgling cable industry to tape the plays, and an offer to take the production to Broadway was likewise spurned. And so the performances of Three Plays of Love and Hate, starring Gena Rowlands, Jon Voight and Peter Falk,went unrecorded, except in reminiscences of the participants and mostly negative reviews. Reisch’s photographs, displayed in the Center Theater during the play’s run but otherwise unseen by the public for 34 years, illuminate a relatively unexplored chapter in Cassavetes’ career. More than that, though, they tap into the emotional depth and electricity of his working process with a rare intimacy. Reisch, who had a role in one of the plays, The Third Day Comes, had a unique perspective on the production: As the troupe’s official photographer (though it’s safe to say that nobody involved would have used the word “official”), he had unlimited access to the daily rehearsals of all three plays, as well as the ongoing stage construction. The unguarded moments that Reisch captured table reads; tête-à-têtes between the director and actors; a kiss between Cassavetes and Rowlands, his wife; are alive with a sense of creative communion, inspiration and hard work. Until the curtain went up on opening night, Three Plays of Love and Hate was, in the deepest sense of the term, a work in progress. As with all of Cassavetes’ work, the subject was love – tortured, tumultuous, exquisite – and the life-defining moments that reveal how we connect with each other, or don’t. For all the emotional intimacy of the material, Cassavetes was choreographing a theatrical experience on a bold scale: Knives had 29 scenes and 35 actors, The Third Day Comesfeatured 41 actors, and the three-hour, 36-character Love Streams moved among 15 locations. A cast and crew of hundreds worked for months with no pay, many of them walk-ins who entered the construction-site theater eager to help paint or build the set, to watch the rehearsals or try to get a few lines in one of the plays. Cassavetes’ open-door policy fostered a communal environment in which creativity could thrive. He pushed people to see themselves as artists who were an integral part of the process. As well as being a uniquely present human being; just look at him looking at his actors in those photos. Cassavetes had a talent for zeroing in on the smallest details of each moment without losing sight of the bigger-picture goal, a truthful work of art. An actor himself, he valued the moment-to-moment experience of the actors above that of the audience; “I hate entertainment,” he once said with great gusto to a documentary filmmaker. Cassavetes’ energy and magnetism drew the like-minded and adventurous to that chaos, the churning raw material of art. On stage and on screen, within shouting distance of the profit-focused Hollywood studios, he pursued the messy beauty of storytelling with a ferocious and exuberant independence. And for a few months in 1981, he embarked on a theatrical adventure with a few hundred collaborators. Looking at Reisch’s images of that vibrant and focused give-and-take, it’s easy to see why the photographer says of the director,”He saw who you were.” Cassavetes’ profound love for his characters and his actors will never dim.